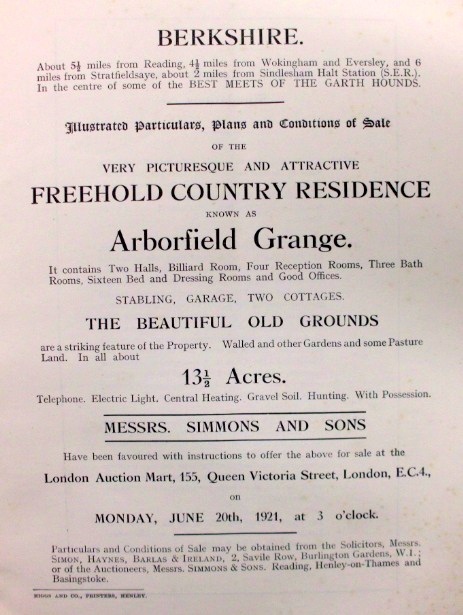 A copy of the Auction Sale document of Arborfield Grange dating from June 20th 1921 can be seen at Reading Local Studies Library along with those for 1887 and 1914 . The main pages are shown here by permission. Arborfield is a Parish situated in one of the most favourable parts of the County. 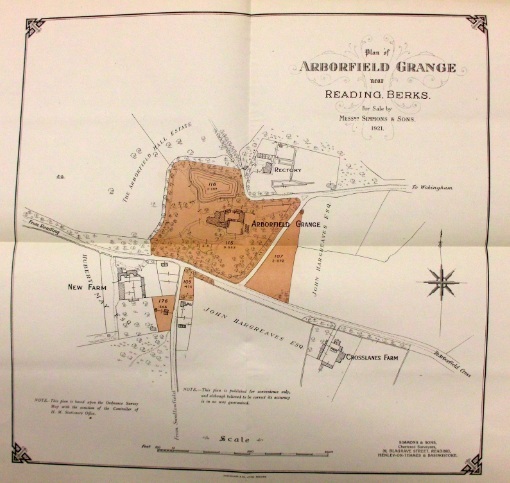 It has an area of about 1,427 acres, with a population of about 250 and consists of a small village with one or two Shops, Post Office (a Pillar Box adjoins the Grounds), and the Parish Church of St. Bartholomew, all within a [few] minutes' walk of “The Grange”. Reading, the County Town, is distant 5½ miles, with an important Junction Station on the Main Line of the Great Western Railway, whence London, the West of England and the Midlands are reached by an excellent service of trains, many of those to the Metropolis being non-stop and occupying 45 minutes only in the journey. There are also branch termini on both the London and South Western and South East and Chatham Railway systems. The quaint old country town of Wokingham and village of Earley are respectively about 4½ and 3 miles, each with Stations on the London and South Western Railway and South Easter[n] and Chatham Railway, and Sindlesham Halt Station on the South Eastern Railway is about 2 miles. through which it is approached by a very pretty Carriage Drive, flanked with Laurels. From another direction a second Drive gives access to the back premises. tile paved, about 14ft. 6in. (exclusive of a large square bay window) by 13ft. 9in. and fitted with fireplace and marble mantlepiece. with oak dado, leading to the first floor. about 17ft. x 16ft. 6in. (extreme length) a cosy Room, partly panelled, and exceptionally well fitted with numerous cupboards, shelves, drawers, etc. about 26ft. 6in. x 19ft. 6in., this room has a quaint old fireplace, oak mantelpiece, and an oak dado. about 17ft. 6in. x 14ft. A very pretty room with oak joinery, open hearth; and opening to a small Lobby and Lavatory and W.C. and thence to the Grounds. measuring about 33ft. x 24ft. It is very lofty and has an arched plaster ceiling in relief with panels and rosettes; a deck-laid dancing floor, with oak parquet surrounds, and is fitted with a beautiful carved white marble mantelpiece, open tiled fireplace. BATH ROOM, having walls in glazed white tiles, Roman enamelled bath (h. and c.), fireplace, W.C.; and another Bed Room. BEDROOM, 19ft. x 14ft. 9in. BEDROOM, about 20ft. 3 in., extreme length, x 17ft. 6in. (into bay). BEDROOM, about 23ft. 3 in. x 13ft. (exclusive of deep bay). This room in old days was apparently the drawing room, and is very lofty with “saddle” ceiling. BEDROOM, about 19ft. 6 in. x 15ft. 6in., with good DRESSING OR SINGLE BEDDED ROOM adjoining. BATH ROOM (h. and c.), and W.C.
THREE MAIDSERVANTS' BEDROOMS and BATHROOM, and also approached by a separate staircase, are Two Attic Rooms (one of which will hold two beds). are on the Ground Floor and well shut-off from the Reception Rooms. They comprise: Kitchen, with “The Rival” range and hot plate, and communicating with scullery with sink (h. and c.); Servants' Hall; Two Larders; Brushing Room; Linen Room; Wine and Coal cellars; Boothole and W.C. The House is lighted throughout by electricity generated on the premises, and very efficiently heated by hot water radiators. The water supply is from a well 320 ft. deep whence the water is pumped by a pump worked by an electric motor which cuts off automatically. The Post Office Telephone is installed. The drainage both outside and inside has just been entirely remodelled under the supervision of Messrs. Watney and Son. Well-fitted Stable of Two Stalls and Two Loose Boxes; Harness Room, with fireplace; large (space for two motor cars) and small coach-house, the former with Groom's Room over; Loose Boxes; Fodder Store, W.C., Two Dog Kennells [sic] and runs, &c. Also Range of Pigstyes, Bicycle-house, Coal and Coke Cellars, and other useful Outbuildings. Well-built and fitted GARAGE 19ft. x 10ft. 9in. (heated by hot water pipes), communicating with repairing shop for chauffeur; Petrol house. ENGINE HOUSE, fitted with Hornsby-Ackroyd 6½ -h.p. Oil engine, dynamo, switchboard, &c., and cell room with 54 accumulators. afford space for two sets of Tennis and there is a charming old-fashioned walled-in Garden with Rose Arches, and well stocked. Small Range of Glass with lean-to Greenhouse (double) and Peach House; span roof greenhouse and Range of Pits. Wired-in bush-fruit garden. Another attractive feature in the Grounds is an Ornamental Sheet of Water, and flanked by well-grown shrubs and underwood, and shaded by forest trees. There is also a Productive Paddock with Pond and (detached) a piece of Vegetable Garden. each containing Five rooms and Large Gardens. The property is subject to a small tithe amounting to £2 3s. per annum. The land tax payable upon the two Cottages amounts to 3s. per annum.